Head to Kansas City for this year’s Dancefestopia Music Festival 2019. An entire city turning into your own party ground EMERALD CITY. This 3-day event will be jam-packed with music, camping, rock climbing, Hot Air Balloons and more! Borda Products has put together a great set of ticket options and we have your Dancefestopia Music Festival Promo Code 2019 “NOCTURNALSD” to save on your purchase. Borda Products has put together a mini city for an all weekend of fun and excitement. One day you can be canoeing, camping, swimming, and of course dancing all day and night to some of the best-talented DJ’s and artists around. Borda Productions Promo Code “NOCTURNALSD” will get you in the door at a discounted ticket price. There is a ticket option for everyone and every budget, so don’t miss out before Dancefestopia 2019 is sold out. We have all your Dancefestopia Discount Tickets including all the attractions in Emerald City for you to enjoy. Don’t pay full price to enjoy the Monkey Zipline, or Tornado Rock Wall. By using Dancefestopia Discount Promo Code “NOCTURNALSD”, it is your choice on how much fun you want to have for this weekend-long Party. 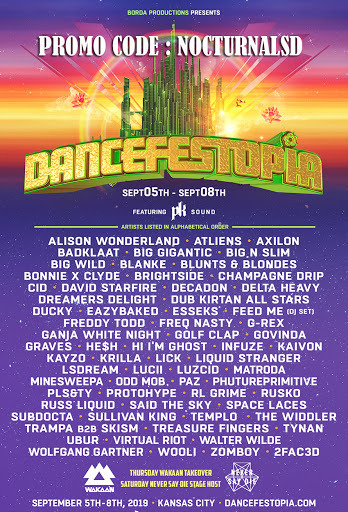 Dancefestopia 2019 at Emerald City Kansas City is set to host some amazing talent for 3 days. You choose you want to see while you take in all the other great events and fun activities brought to you by Borda Productions.